2. No black dogs with white ears. 3. No calculating of the air speed velocity of an unladen swallow. 4. No DYNAMITE. (Dynamite is the greatest drinking game in the history of the world, involving dice, yelling of the phrase “DYN-O-MITE” and (sometimes) explosions. I’m pretty sure that’s what this picture is referring to, and if so, I must respectfully decline to follow that rule. 5. 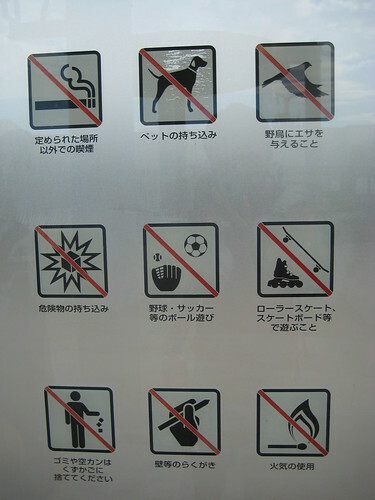 No playing baseball with soccer balls. Makes sense. Soccer balls are way too big for baseball gloves anyway. 7. No dropping your juggling balls if you are a juggler. Keep those balls in the air and off the ground, or don’t juggle at all! 9. We didn’t start the fire. It was always burning since the world’s been turning. See, you don’t even have to know Japanese to get around here!